Down & Out Books, 9781943402007, 314pp. MWA Grand Master Margaret Maron, Edgar Award winner Tom Franklin, and New York Times bestselling novelist Ron Rash headline a new anthology of 21 tales spanning from traditional detective stories to comic capers to darkest noir and more-something for all tastes. 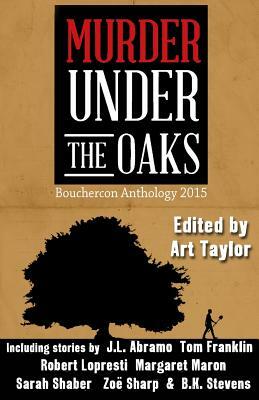 Murder Under the Oaks is published in conjunction with Bouchercon, the World Mystery Convention, held in 2015 in Raleigh, North Carolina-the City of Oaks. As with the convention itself, the anthology spreads a broad canopy across a wide range of crime writers from across the country and around the world-including both veteran writers and the brightest up-and-coming talents in the field. Several of the stories in Murder Under the Oaks draw on the region's history and culture-including the birth of a secret society at the University of Virginia, a mystery from Edgar Allan Poe's childhood days, and a series of less-than-welcome visits by everyone's favorite hometown sheriff. All participants contributed their efforts to support our charity-the Wake County Public Libraries-and by extension readers and writers everywhere. All profits go to the library. Edited by Art Taylor Including Stories By J.L. Abramo J.D. Allen Lori Armstrong Rob Brunet P.A. De Voe Sean Doolittle Tom Franklin Toni Goodyear Kristin Kisska Robert Lopresti Robert Mangeot Margaret Maron Kathleen Mix Britni Patterson Karen Pullen Ron Rash Karen E. Salyer Sarah Shaber Zo Sharp B.K. Stevens Graham Wynd.